Avocados are a superfood praised for their high nutritional value and healthy fat content. The fruit is high in antioxidants and monounsaturated fats, which help to reduce cholesterol and control blood sugar levels. It is also rich in dietary fibre, potassium and magnesium. Avocados have a creamy, smooth texture that makes them a delicious substitute for butter and mayo. Their mellow and buttery flavour complements stronger flavours, such as citrus, quite nicely. Avocados are available year-round in grocery stores thanks to Mexico's warm climate, but they are in season from March to September in the U.S., particularly California. Droughts and cold weather sometimes affect crop availability, and that can impact the price of avocados, as well as the start and end of the fruit's season. There are several different varieties of avocado, but the main type found at your local grocery store is likely of the Hass variety. They are also known as an "alligator pears," because they only ripen after they are picked (like pears), but have a tough scaly skin that you have to remove. Avocados are difficult to choose, because they take a while to ripen, and imperfections may not be noticeable until the fruit has ripened. To choose your avocado, keep in mind when and how it will be used. If you're looking to mash your avocados to make guacamole, then you will want softer ones that are more likely to be ripe. If you prefer to slice your avocado, choose one that is harder and less ripe. You can tell an avocado is ready to eat by taking the top pit off and seeing if there is a bright green colour underneath as opposed to a yellower or brown-green. Avocados should be kept stored on the kitchen counter until ready to eat, at which point they can be refrigerated. Store them with bananas in a brown paper bag to ripen them faster, and check them every day until they are ready to be eaten, as they ripen quickly. Plan to use your avocado within one to three days from when you purchase it. Avocados can be used in a variety of different dishes from appetizers and grain bowls to desserts and salads. They can be served mashed with or without added citrus juice, chopped in a salad or tacos, or sliced on top of a burger. They can even be oven roasted as fries or blended into a smoothie — the options are endless! 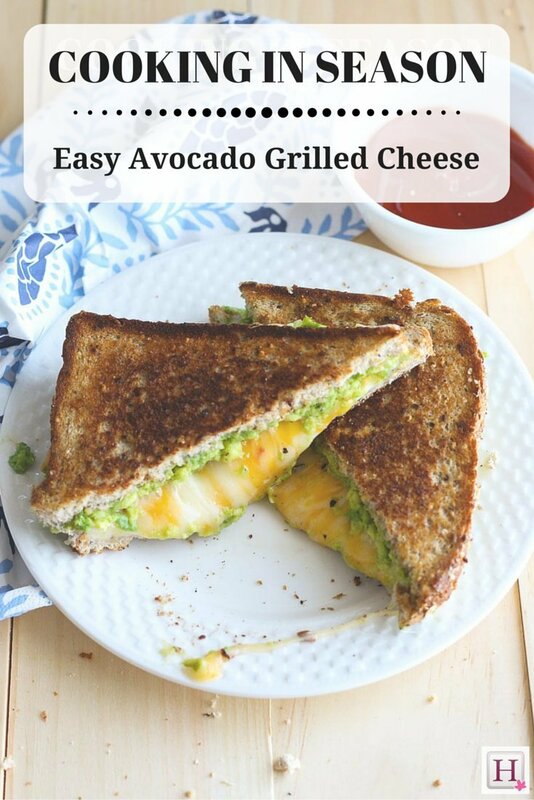 In this easy grilled cheese recipe, the avocado is an added nutritional twist on a classic quick lunch. Mash avocado in a small bowl, and then spread onto two slices of bread. Top with shredded cheddar and slices of mozzarella. Close the sandwich. Melt butter in a large frying pan on medium heat until it starts to bubble. Place sandwich on the pan and cook for about 3 to 4 minutes, covering with a glass lid to keep heat inside the pan. Flip and cook for another 3 to 4 minutes, watching closely to ensure sandwich doesn't burn. Serve the grilled cheese on a plate with a side of ketchup for dipping. Enjoy!